From I-ville to You-ville, the well-known, best selling Orthodox Christian children's book of Greece, presently in its eighth printing, is now available in English. This is Christian allegory reminiscent of Bunyan's Pilgrim's Progress. The unique and wise counsel of Elder Paisios of the Holy Mountain is presented in a way that is perfect for children and adults alike. 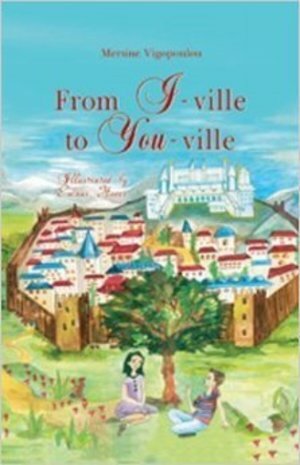 In every turn and twist of this adventure of a young man making his way from his home of I-ville to the unknown, but longed-for, kingdom of You-ville the author masterfully weaves the wisdom of the elder into the fabric of the story, constructing a seamless garment of beauty, charm and enlightenment. I-ville - a Kingdom where pride and selfishness dwell, and where people live by the motto "Me first!" You-ville - a Kingdom where humility and kindness have their home, and where people put the good of others before their own. This is the story of a young boy named Stubborn, as he strives to become the first person of I-ville to make the difficult journey to the beautiful, joy-filled Kingdom of You-ville, and to become a citizen there. As we join Stubborn in his adventures, we learn, along with him, profound lessons in how to struggle against bad thoughts and feelings. The journey of young Stubborn is one that all of us - old and young - must take, and which all of us can accomplish - if only we shrink our "I" and put "You" first! The author, Mersine Vigopoulou resides in Souroti (Thessaloniki, Greece). She is also the author of several of other acclaimed children's books, including the forthcoming Lady Tradition and Orthodoxy. The English edition has all-new full-color illustrations by Emani Heers.